The smell of fresh mint is still in my nose! I spent last weekend at my mother’s house in the countryside, more precisely in her garden and kitchen and the smell of herbs and flowers was always around us. She is one of those lucky people who has a green thumb and lots of space to prove it. The strong sun and heavy rain of the past days turned her garden into a blossoming green world with various shades of red, pink, violet and yellow. Whenever I passed her flower and vegetable beds a cloud of roses, thyme, lavender and mint followed me. This was aroma heaven and the the strong mint was a very persistent companion! My mother’s vegetable garden made me jealous, artichokes, lettuce, carrots, potatoes, peas and many more, she can honestly compete with my market stands at home! Her herbs grow like weeds, some of them have had their roots in this ground for almost twenty years. The path from her garden to the kitchen isn’t long and we brought lots of these goods inside the house in the past days. 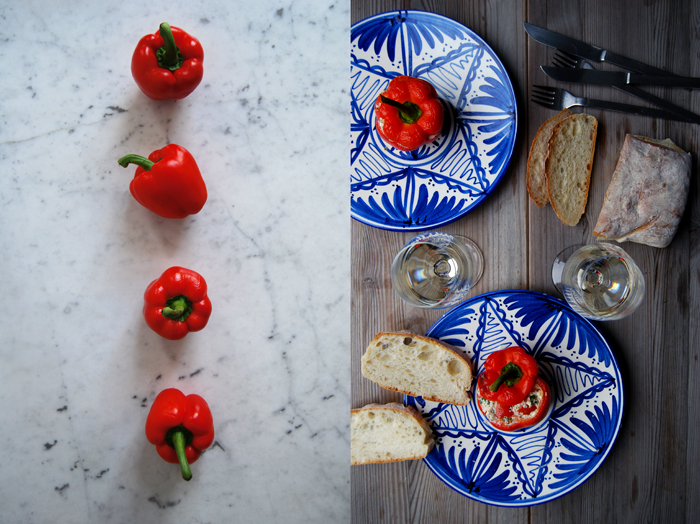 We cooked big artichokes with three different kinds of dips, a delicious, light pasta recipe with tomatoes and bell pepper and fish soup. On the sweet side, we had strawberry tarts, ice cream in espresso and I also got to love a great summery aperitif with Limoncello, white wine, lemon rind and mint, needless to say that it was all wonderful and I will write more about it in the coming days. 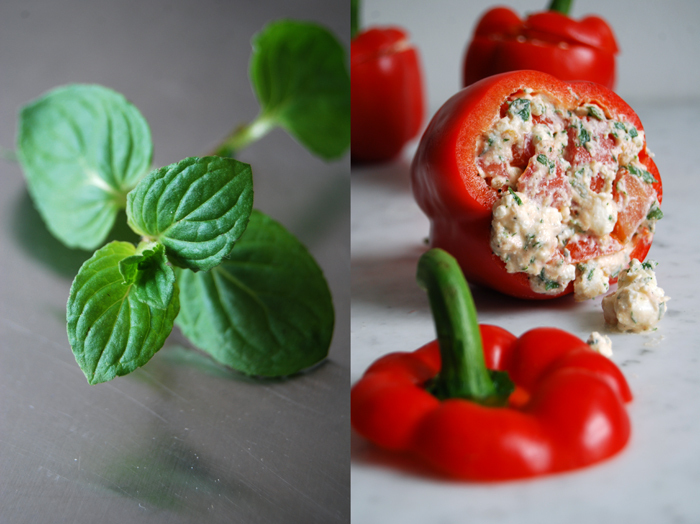 Back to the fresh mint, here is a recipe so quick to prepare, it looks beautiful and combines a few ingredients which I love for my cooking in summer, bell pepper stuffed with feta, tomatoes, parsley and mint. After twenty minutes in the oven it’s done, having four or ten people to feed doesn’t make much of a difference, this is a real crowd pleaser! Cut the top off the bell pepper and set aside. 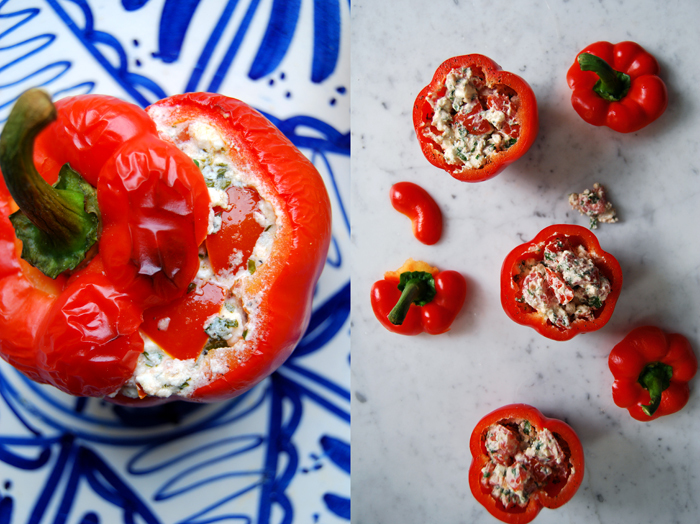 Mix the feta, tomatoes and herbs and season with salt and pepper to taste. 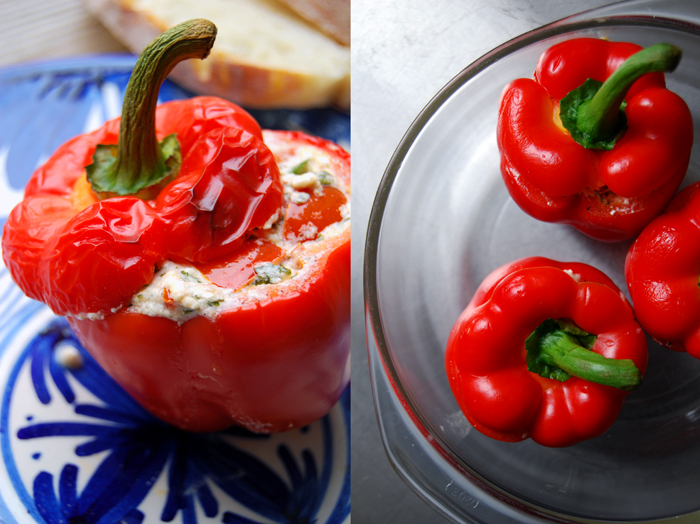 Fill the bell pepper with the cheese mixture, close the fruit with the lid and put in a baking dish. 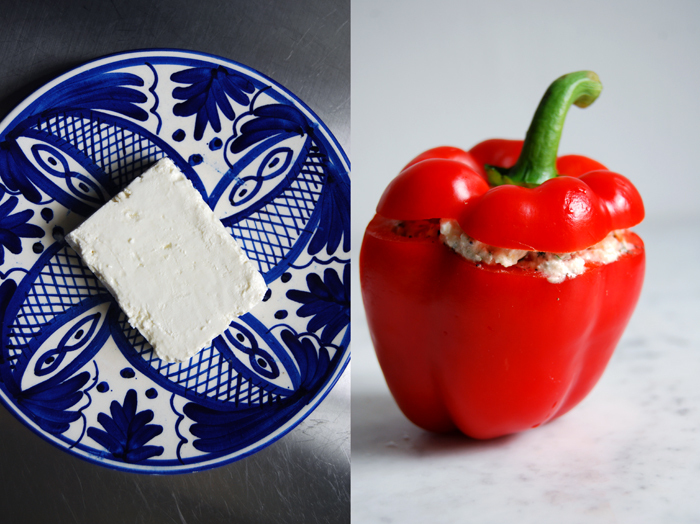 Bake for 17 minutes, the bell pepper should be al dente.